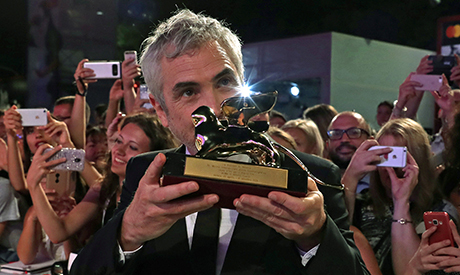 Oscar-winning director Alfonso Cuaron’s “Roma”, a black-and-white drama based on his childhood in Mexico, won the Golden Lion at Venice on Saturday, an important victory for the streaming company Netflix, which will distribute it worldwide. Willem Dafoe won Best Actor for the Vincent Van Gogh biopic “At Eternity’s Gate” and Britain’s Olivia Colman won Best Actress for her role as the 18th-century Queen Anne in “The Favourite”, a movie that won the runner-up Grand Jury Prize. Jennifer Kent, the only woman director in a field of 21 vying for the Golden Lion, won the Special Jury Prize for the bloody revenge thriller “The Nightingale”. The film’s male lead, Baykali Ganambarr, won the award for best up-and-coming actor/actress. The Silver Lion, awarded to the best director, went to France’s Jacques Audiard for his comedy-Western “The Sisters Brothers”. Joel and Ethan Coen won the prize for best screenplay, also for a Western, “The Ballad of Buster Scruggs”.